Here are just some of the ways that Measure B1 is Unfair, Unlawful and Unnecessary. Gives big tax breaks to multi-billion dollar corporations, transferring the cost to individual homeowners and families. Follows the same different-tax-rate structure—due to the tax cap for big corporations—as Measure H, which the courts ruled was illegal. Is premature. The school district won’t tell you that the current parcel tax runs for another two years. There’s still time to get the parcel tax right. 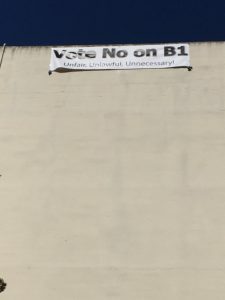 Vote No on B1 and make the school district fix it.